The Open Biology Journal is an open access online journal, which publishes research, review/mini-review and letter articles and guest edited single topic issues, reviews and letters in all areas of biology and at the interface of related disciplines. The core disciplines in biology that are published in the journal are the following: Cell & Developmental Biology; Genetics & Genomics; Molecular Biology; Structural Biology; Bioinformatics; Systems Biology; Immunology; Biochemistry; Ecology; Zoology; Ornithology; Entomology; Marine & aquatic Biology; Plant Biology; Bioethics; Behavioural science ; Microbiology; Reproductive Biology; Glycobiology; Macromolecules; Proteins & Peptides; Theoretical & Mathematical Biology; Evolutionary Biology; Techniques in Biology; Biotechnology, Applied Microbiology, Biodiversity Conservation, Biophysics, Biostatistics, Crystallography of macromolecules., education in biology, Marine & Freshwater Biology, Mathematical & Computational Biology, Mycology, Nanoscience & Nanotechnology, Parasitology, Paleobiology, Astrobiology; Physiology, biopolymers, Soil biology, and Interdisciplinary Applications in biology. 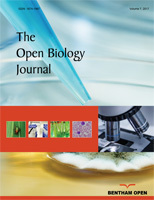 The Open Biology Journal, a peer-reviewed journal, is an important and reliable source of current information on developments in the field. The emphasis will be on publishing quality papers rapidly and freely available to researchers worldwide.